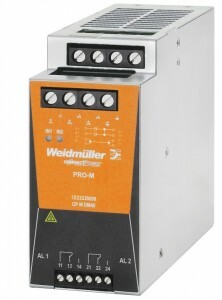 When you absolutely, positively must have power Weidmuller’s ELV DC Power Supply Redundancy gear comes into its own. Power Supply Redundancy is basically the duplication of critical components to ensure continued operation under fault conditions. Dual redundancy allows for a single component fault. To be classified as a dual redundant power supply system, steps must be taken in the design to ensure that the failure of one power supply does not interfere with the operation of the other power supply. 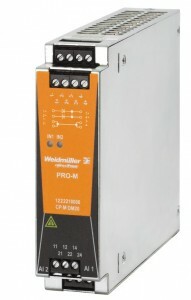 To achieve this situation the use of additional components outside the power supplies is required. Redundancy – How do we achieve it? To prevent this occurring we must provide a one way current path from the outputs of both power supplies. This is achieved by the use of externally connected full current rated power diodes, sometimes referred to as “Auctioneering Diodes”. These are fitted in series with the positive output of each supply. This will prevent the back feed of current to the failed power supply. By always using external diodes with two identical power supplies you will achieve redundancy regardless of the type of power supplies selected. When connecting power supplies this way it is recommended that you adjust each power supply output voltage to be within 50mV of each other.